We provide the most advanced medical thermal imaging systems, in conjunction with services that include medical interpretation of the images by doctors who are board certified clinical thermologists. We also provide equipment training and offer full administrative support. IR Distributions provide the newest hardware and software technologies on the market including all its systems. 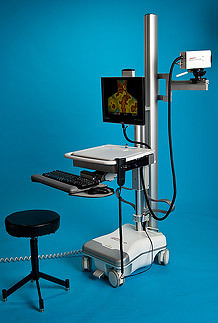 This allows clinicians to easily and adjunctively image for: breast cancer, peripheral vascular disease, neuromusculoskeletal disorders, extracranial cerebral and facial vascular disease, thyroid gland abnormalities, and various other neoplastic, metabolic and inflammatory conditions. We constantly strive to be at the forefront of the newest advancements in medical infrared imaging technology. IR Distributions considers the future of adjunctive imaging technology to be led by medical thermal imaging. The reasons are clear; thermography emits NO radiation, uses no consumables, and works alongside many of today’s common diagnostic procedures, and it allows clinicians to provide their patients with a unique adjunctive functional evaluation. The use of the our thermography system is NOT intended to be a sole diagnostic procedure.